Simply the best, there is no better Digital Organs than those produced by Makin, Copeman Hart, Johannus and Rodgers with a wide range of instruments in many styles available for home or church use. In the UK, ChurchOrganWorld sell Copeman Hart and Makin instruments which are market leaders with the true English Organ sound. Johannus provide us with a wide range of available models for the important French, German and Dutch organ schools with some models having a significant American slant to them. Rodgers is different in that they focus 100% on the true American sound which of course is loved by so many. The advantages for the customer in having so many options available under one roof are many, including for example a wider range of styles of instruments and levels of pricing. As a company we invest far more in customer services such as product support and maintenance than the norm. If looked after, with a good maintenance schedule, our instruments have incredible reliability and longevity, leading to tremendous levels of customer satisfaction. Whether you require a simple home practice instrument or something bespoke for a large cathedral we will have a variety of options for you available at very competitive prices. All our instruments are built with slow-grown North American Oak to build our top quality consoles and look new even after 10 years! Our breakthrough technologies have changed the organ world; there will be more breakthroughs in the future as we update our technologies annually. We build the only real substitute for a good pipe organ. 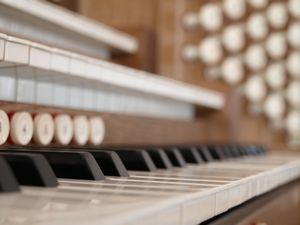 You may see a digital organ but what you hear is a pipe organ. Why would you buy a poor copy of a pipe organ, when the best is available? Seven organs, seven organists, seventeen manuals!